All Purpose Premium Potting Mix which consists of an unique blend of Coco peat, Vermiculite and 100% Organic Phazed Fertilizer which makes it very easy to handle and use. Ghana Jeevamrutha is an organic fertilizer which enriches the soil and plant and provides all the nutrients required for the growth of the plant. It is a rich source of Nitrogen and valuable micro-organisms which naturally enhances soil fertility. Cocopeat is a natural organic soil supplement which prevents the soil from hardening and keeps it loose, besides improving the water retention capacity and providing essential pant nutrients. 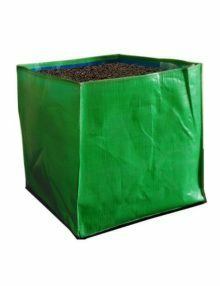 Square HDPE Woven Grow Bag 12″x 12″x 12″ are ideal for balcony or small gardens, where space is a premium and you don’t want to be fiddling around with dirt. Rose mix is the best flower plant food. Manufactured through various organic nutrients extracted from different Ayurveda plants and oil cakes such as neem cake, honge cake and castor cake. Which supply all essential nutrients for rose plants and other flower plants. Neem Oil has many beneficial uses. Neem oil is a highly effective and 100% natural pesticide, extracted from the seeds of the Neem tree in India. Neem oil is non-toxic to animals or people. Neem is systemic. Epsom salt, named for a bitter saline spring at Epsom in Surrey, England, is not actually salt but a naturally occurring pure mineral compound of magnesium and sulfate. Fertilize your houseplants – Most plants need nutrients like magnesium and sulfur to stay in good health and Epsom salt makes the primary nutrients in most plant foods (nitrogen, phosphorus, potassium) more effective. Sprinkle Epsom salt once weekly to help nourish your houseplants, flowers and vegetables. Keep your lawn green – Magnesium sulfate crystals, when added to the soil, provide vital nutrients that help prevent yellowing leaves and the loss of green color (magnesium is an essential element in the chlorophyll molecule) in plants. Add 2 tablespoons of Epsom salt to a gallon of water and sprinkle on your lawn to keep the grass healthy and green. Insecticide spray – Use Epson salts on your lawn and in your garden to safely and naturally get rid of plant pests. Soil Incorporation – Broadcast 1 cup per 100 square feet, mix well into before planting. Applying in Liquid Form or Drenching – Drenching plants with Epsom salt improves the overall health of the plant by providing a good dose of magnesium. If your plants are needing a boost, dissolve about one to two tablespoons of Epsom salt in a a gallon of water. Pour at the base of the plant and allow the water-salt solution to soak into the ground. Repeat throughout the season as necessary. Neem Cake is the residue obtained from neem seed kernels which have been crushed to extract the oil. Rich in N-P-K, it is an excellent organic fertilizer. Neem cake has been known to enrich the soil and protect the plant. Sow in garden. Sow seed at a depth approximately three times the diameter of the seed. Best planted at soil temperatures between 16°C and 30°C. Broadcast sow and thin to 45 cm apart. Grows to about 60cm. Harvest 30 -45 days A half-hardy herb with feathery leaves. . Needs full sun and mulch to prevent drying out. Keep very well watered. If they dry out, then they will bolt to seed. Plant in successions (planting new seed every few weeks) to get a continuous supply. Bird feeder which is used to attract a variety of garden bird. Give garden birds some tasty treats with this simple, but attractive bird feeder. Install Bird feeder in your garden, balcony or backyard to attract a range of garden birds from sparrows to parakeets. The bird feeder has four easy to perch, grain saving feeding port. Made from high quality food grade plastic it’s easy to install, refill and clean. Usage: Add 10ml of Clotol H to 1 liter of water and spray on plants. For better results spray on both sides of the leaves and other parts where insects are found. Pellets for rose are of pulverized select oil cakes and growth promoting materials and have all the needed macro and micro nutrients to stimulate growth, induce flowering. Bone meal fertilizer is often used by organic gardeners to add phosphorus to garden soil. Bone meal is a mixture of finely and coarsely ground animal bones and slaughter-house waste products. It is used as an organic fertilizer for plants and as a nutritional supplement for animals. As a slow-release fertilizer, bone meal is primarily used as a source of phosphorus and protein. Agni astra is a complete organic pesticide prepared with the Indian traditional methodology. Panchagavya/Panchakavya is a Organic Plant Liquid Fertilizer. Works as growth Stimultant. The manure pellets are made from selected oil cakes and growth promoting substances and they provide the plants all the needed micro and macro nutrients. These pellets are “organic manure pellets”, Eco-Friendly & Nontoxic. *Helps in glowing skin . Soft, corded foam ear plugs that conform to the unique shape of each ear for excellent hearing protection and comfort. Ashwagandha seeds can be direct sown outdoors, approximately 3/8″ below the surface of the soil and kept evenly moist. Otherwise, you can sow indoors in early spring to give your starts additional time to develop before going outside. Sow seeds slightly closer to the surface (~1/4″) if using flats or other small containers indoors. This Manure is for organic gardeners, creating a living soil rich in humus and nutrients is the key to growing great fruits and vegetables, abundant flowers, and long-lived ornamental trees and shrubs. The overall fertility and viability of the soil, rather than the application of fertilizers as quick fixes, is at the very heart of organic gardening. Made of complete organic waste including leaves, riped vegetbles and fruits. Cucumbers grow very well in warm climates like the type we are used to in India. They need full sun and can be grown in a container or saplings can be planted directly in the ground. They would need adequate space to climb like a trellis or a wall etc and given some light they will grow uninhibitedly. This variety of slicing cucumbers has sprawling vines with large green leaves and curling tendrils. The seed takes about 3-5 days to germinate post which the fruits will take another 30 to 40 days to appear. The growth of the plant is fast and you will have a bumper crop if you water and care for them regularly. At a time you can expect at least 10-15 cucumbers and you would have to pick the fruits every 2 days. With every order you will receive guidelines for sowing, replanting and care. Also we at GreenMyLife are always a mail away for any questions you may have about your plants. Thyme is a small perennial shrub with lots of branches and light purple to pink flowers. It’s aromatic and has a pleasant, pungent, clover flavor. There are over fifty varieties used in cooking and gardening. English thyme is used most often in cooking. Gently scatter seeds over the soil in the container you will be planting thyme seeds in. Next, gently scatter soil over where you scattered the seeds. Water thoroughly. Cover with plastic wrap. Place the container in a warm location. Seeds will germinate in 1 – 12 weeks. Once thyme seedlings are 4 inches high, plant them where you will be growing thyme in your garden. Suvarna Mico Food contains a balanced composition of all micro elements, namely, Copper, Iron, Manganese, Zinc, Boron and Molybdenum & Magnesium Oxide. Since there is a perfect balance of all the micro nutrients, a prophylactic application of this Micro Nutrient Fertilizer virtually ensures a micro-nutrient deficiency free crop, with excellent health of the crop and finest quality of the produce. Pole Beans are one of the few vegetables that add a sense of height to the vegetable garden. They climb any vertical support and are the best to grow if you there is limitation of space. Pole Bean Seeds should be planted 1-1.5 inches deep and 2-4 inches apart.They can tolerate full sun but the yield might reduce in partial sunlight or shade. Also we at GreenMyLife are always a mail away for any questions you may have about your plants. Mycotol H –Eco-friendly microbicide for plants. *Keep the product away from children. *Keep the container closed to prevent evaporation. *Wash hands with soap and water after handling.